This gorgeous kitchen by Agean Kitchens serves as a focal point of the home and offers visual interest and creativity, as well as a high level of functionality. 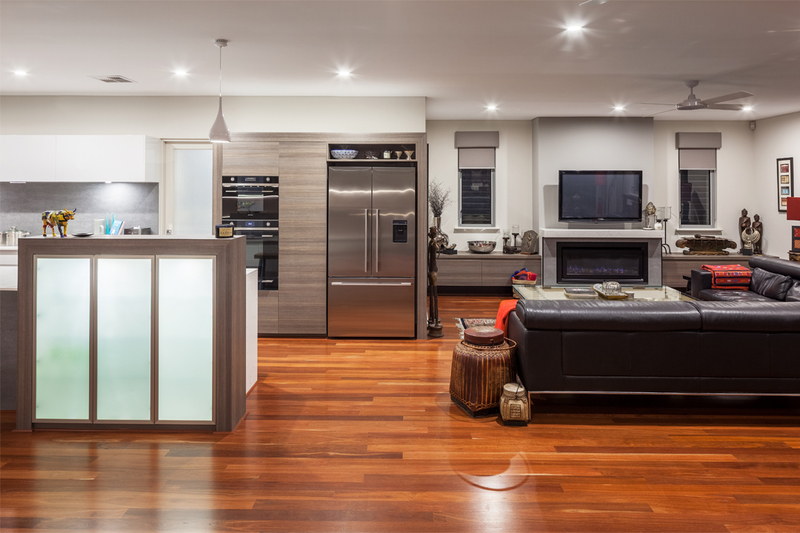 The ingenious design allows the kitchen to assimilate with the rest of the home, and effectively defines its own space without being segregated from the contiguous design of the interior. This is enabled by a seamless continuation of the rich timber flooring, ample overhead lighting and a galley-style arrangement of built elements that permits easy flow between the indoor and outdoor areas. 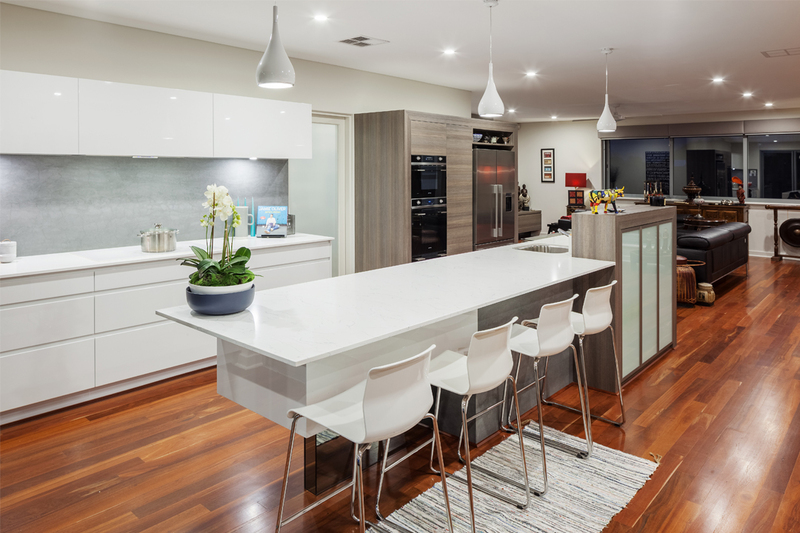 Working closely with the homeowners and builder, Agean Kitchens formulated a stylish design, which is immediately apparent in the timber veneer and opaque glass island feature. The feature also includes built-in lighting, which frames part of the breakfast bar and provides a level of privacy behind which to prepare food when guests are present. 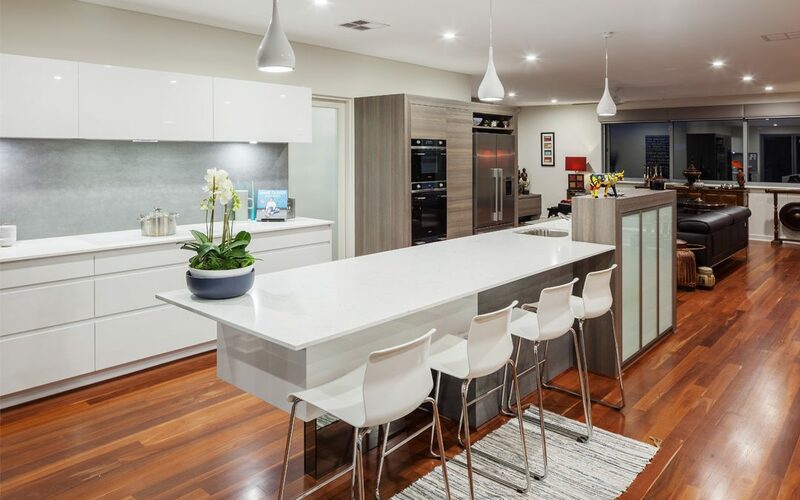 The kitchen comfortably accommodates two working cooks, with a double oven and large pantry in addition to two large benches that are crafted in ‘Alpine White’ Quantum Quartz. A particularly special feature of the kitchen is the white induction cooktop that vanishes almost completely into the benchtop. Many functional storage solutions have been included in the design, with the most impressive being the seamless, under-counter drawer profiles and similarly handle-less overhead cupboards. A cool-grey Laminam splashback draws the eye to the back of the kitchen, with its beautiful texture lit from above by recessed lighting. The same material grounds the island and forms a delicate juncture between the velvet-finish white melamine and timber-veneer cabinetry. Finally, a mirrored kickboard located beneath the island creates the illusion of continued space, without the need to engineer a cantilevered bench. The unique design is a testament to the flawless craftsmanship that’s promised by Agean Kitchens, and to its uncompromising use of high-quality materials in the delivery of show-stopping kitchens that reflect each owner’s taste and lifestyle.